We are currently very busy and on a 12 month backlog on BECK SPYDER® builds. Please contact us for lead time on "roller" packages. Please check the USED BECK INVENTORY tab for a selection of quality pre-owned BECK product. Each of these has been subjected to the 100+ point Quality Inspection and Service before being offered for sale. The BECK SPYDER holds its value very well in the secondary market and they generally sell very quickly from our Pre-owned selection for several reasons including the fact that you can own a BECK SPYDER without queing up in the production time waiting list, currently about 6 months. An important word about our Water Cooled BECK SPYDER® Program. The Subaru 2.5 Liter engine seems to have become the powerplant of choice in the BECK Spyder® for those seeking a water cooled car. We have built many of these and our customers are thrilled with the power and overall performance. 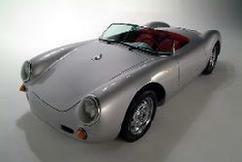 The watercooled version combines the more classic BECK Spyder® appearance with a more modern engine. The computer controlled, 4 cylinder, boxer style engine, 4 speed gearbox, 4 wheel disc brakes are but a few of the special features offered as Standard equipment on this offering. Prices start in the upper $40K range. Subaru powered versions. These are a custom order, and require additional time to complete to your specific requirements. Carey Hines is the head of our shop and the "go to" guy for all of the details of these special Spyders. He is available by phone after 4pm, when the shop winds down a bit from the days production.